(CBS News) If there's one constant in the presidential race, it's this: A small group of states that will decide things. CBS News now estimates President Obama has 237 electoral votes at least leaning his way; Mitt Romney has 206, based on state and national trends over recent weeks, state characteristics, and the demographic groups currently in play. These figures include those from still-contested battleground states that are now also leaning (for the moment, anyway) to one side or another. 270 electoral votes are needed to win the presidency. Wisconsin remains a tossup race and a battleground, as it was even before Paul Ryan's selection. If anything it's gotten even more tossup-y. Our Quinnipiac/CBS News/NYT poll out today shows the president holding his lead there but the gap has closed to two. The state's partisan profile and electoral history points to tight races - 2008's wide margin was the exception, not the rule - and it figures to be that way again. The overall electoral math remains focused on big toss-up prizes like Ohio and Florida. In both places the President has held leads, as he does in our newest polls, but they're certainly not large enough to overcome any variations in turnout or shifts in allegiance from softer supporters as we go forward. Smaller toss-ups like Colorado and Nevada out west, and Iowa and New Hampshire, continue to play pivotal roles. A lot of data out this summer - including our own polling - suggest the president is ahead in Pennsylvania. This may not surprise, as the state's Democratic-leaning history would suggest that so long as Mr. Obama is leading (or close to even) nationally - as he is - Pennsylvania would be among those more likely to stay in his camp. (The state has voted Democratic since 1992 no matter the national winner.) So it leans blue right now but remains on our battleground list of states to watch, as Romney still has the potential to make inroads - especially if he generates a national wave later on. 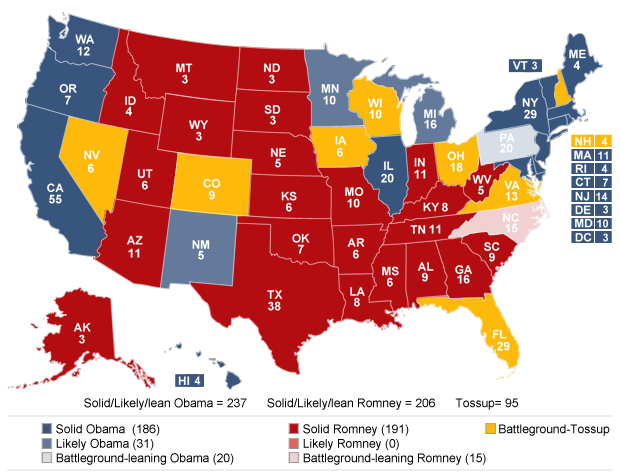 North Carolina remains a battleground to watch, too, but also should be considered leaning slightly to Romney. Recall that Mr. Obama barely won the state in '08 in a year that he had a national wave at his back. North Carolina upped its Democratic vote share that year at a greater rate than many other states did, and Mr. Obama outperformed other recent Democrats across smaller counties and with white voters and men. But Romney's stronger standing among those groups, coupled with a still-tough state economy, make this a comparably larger challenge for the Democrats, who could keep it in their column if they maximize their base turnout. Both sides are spending and organizing hard, so stay tuned. Meanwhile New Mexico, with strong support from Hispanic voters, appears more likely for Mr. Obama.